German gynecologist and medical writer; born at Ostrowo, Prussia, 1839; died at Berlin Dec. 22, 1893. After completing his course at the gymnasium he entered the University of Berlin, graduating thence as doctor of medicine in 1864. In 1866 he settled as a physician temporarily in Drebkau, Prussian Silesia, but subsequently removed to Berlin, where he succeeded in building up a large practise, and became a specialist in gynecology. 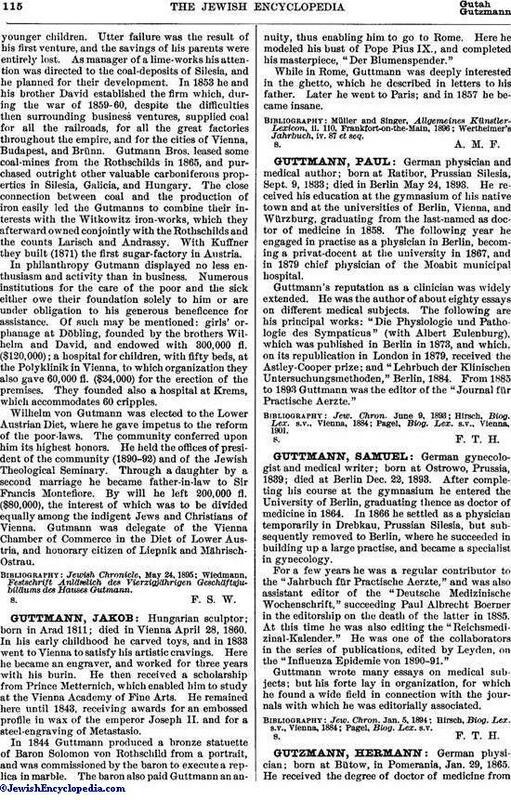 For a few years he was a regular contributor to the "Jahrbuch für Practische Aerzte," and was also assistant editor of the "Deutsche Medizinische Wochenschrift," succeeding Paul Albrecht Boerner in the editorship on the death of the latter in 1885. At this time he was also editing the "Reichsmedizinal-Kalender." He was one of the collaborators in the series of publications, edited by Leyden, on the "Influenza Epidemie von 1890-91." Guttmann wrote many essays on medical subjects; but his forte lay in organization, for which he found a wide field in connection with the journals with which he was editorially associated.